Pyrénées-Atlantiques (French pronunciation: ​; Gascon: Pirenèus-Atlantics; Basque: Pirinio-Atlantiarrak or Pirinio-Atlantikoak) is a department in Aquitaine, southwest of France. It takes its name from the Pyrenees mountains and the Atlantic Ocean. 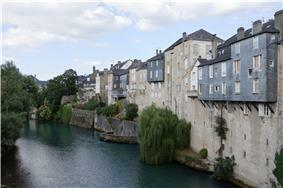 It covers the French Basque Country and the Béarn. Basses-Pyrénées is one of the original 83 departments of France created during the French Revolution, on 4 March 1790. It was created out of parts belonging to the former greater province of Guyenne and Gascony, as well as the Béarn-Navarre (still, at least nominally, Kingdom of Navarre), i.e. the Basques provinces of Basse-Navarre, Labourd, Bayonne (detached some years before from Labourd), and Soule, and Béarn. The history of the region, under the Ancien Régime, can be found at those individual regions. The Basque third-estate representatives overtly opposed the new administrative layout since it suppressed their institutions and laws. The two representatives of Lower Navarre refused to vote arguing that they were not part of the Kingdom of France, those of Soule voted against, while the brothers Garat, representing Labourd, eventually voted yes, thinking that would give them a say in upcoming political decisions. On 10 October 1969, Basses-Pyrénées was renamed Pyrénées-Atlantiques. Pyrénées-Atlantiques is part of the Aquitaine region of Southwest France. 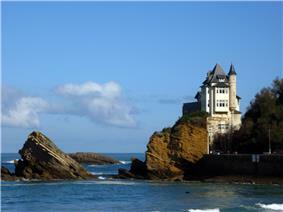 It is bordered by the Landes, Hautes-Pyrénées, Gers departments and the Bay of Biscay. Principal settlements include Pau, Oloron-Sainte-Marie, Orthez, Biarritz, Bayonne, Anglet, Urrugne, Saint-Jean-de-Luz and Hendaye. Lac Gentau is located here, as are the Lacs de Carnau. 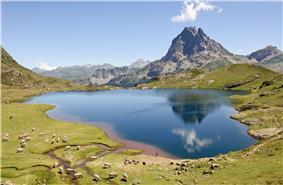 Pyrénées-Atlantiques, a border province, has cultivated a number of economic and cultural links with Spain. These parts of the department that were part of Guyenne and Gascony, and Béarn have a culture heavily influenced by the Basques, but clearly different identities. 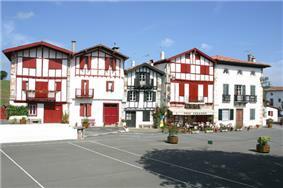 Both the Gascon Bearnese variant and Basque language are indigenous to the region in their respective districts. Gascon in turn is a dialect of Occitan, formerly the main language of southern France. It is more closely related to Catalan than it is to French. Basque is a language isolate, not related to any known language. Today, French, the sole official language of the French Republic, is the predominant native language and is spoken by virtually all inhabitants. Pyrénées-Atlantiques is also home to a number of professional sports teams, including Aviron Bayonnais, Biarritz Olympique, Section Paloise (rugby), Élan Béarnais Pau-Orthez (basketball) and Pau FC (association football). The Pau Grand Prix, an auto race first held in 1901, has hosted the World Touring Car Championship, British Formula Three, Formula 3 Euro Series and FIA European Formula 3 Championship.